It’s hard to believe that we almost nixed the Ring of Kerry from our itinerary. Traveling in Ireland for a week, I was getting worn down of our late nights and busy mornings. But Mr. Yoder convinced me that we’d come so far and shouldn’t miss something we really wanted to see. 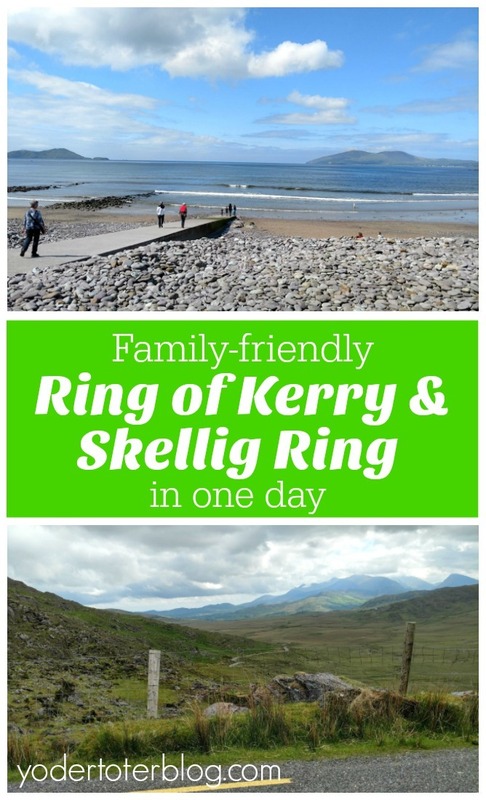 I’m so glad we decided to venture to the Ring of Kerry and Skellig Ring. 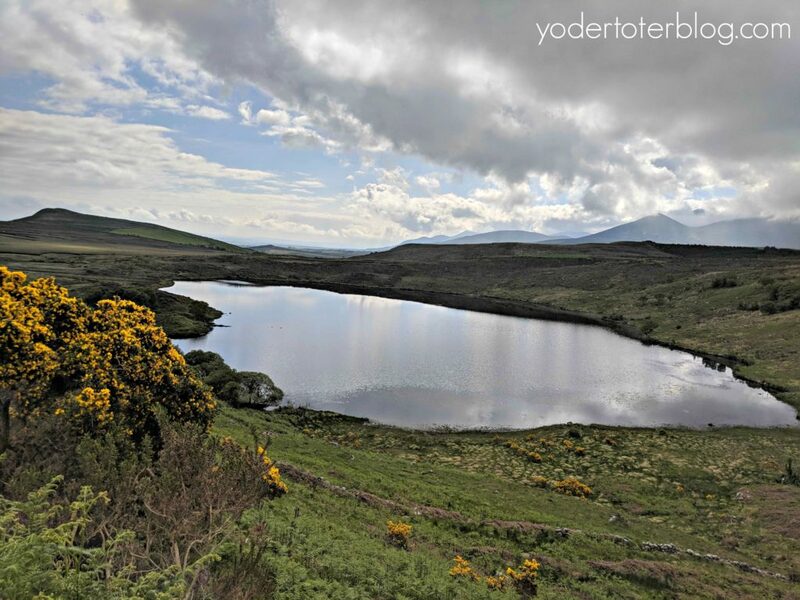 We had an unforgettable day with unbelievable Irish weather – plenty of sunshine and 75. Our Airbnb was actually located just minutes from the Ring of Kerry near Killorglin. Most tour buses depart near Killorglin and travel counter-clockwise around the Ring of Kerry. Tour buses are too large to pass on the Skellig Ring, so they avoid it. We decided to drive clockwise to avoid the buses, but it was another last-minute decision that made our day even more worthwhile. While guidebooks AND Rick Steves (those are basically one in the same, right?) 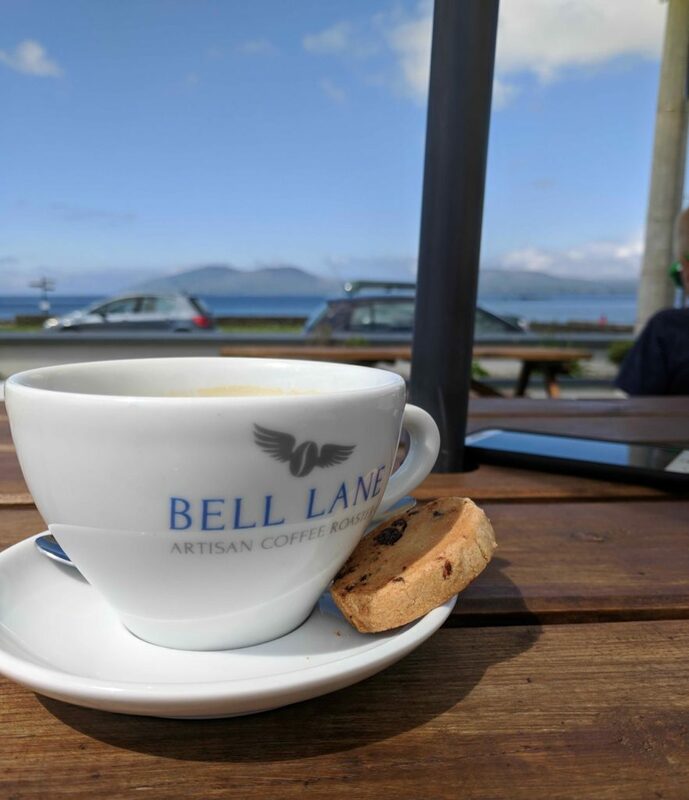 recommend beginning the day in Kenmare and working your way around the peninsula, we were so close to Caragh Lake, we decided to forego the long drive to Kenmare and cut the Ring of Kerry in half by making Waterville our first point of interest. 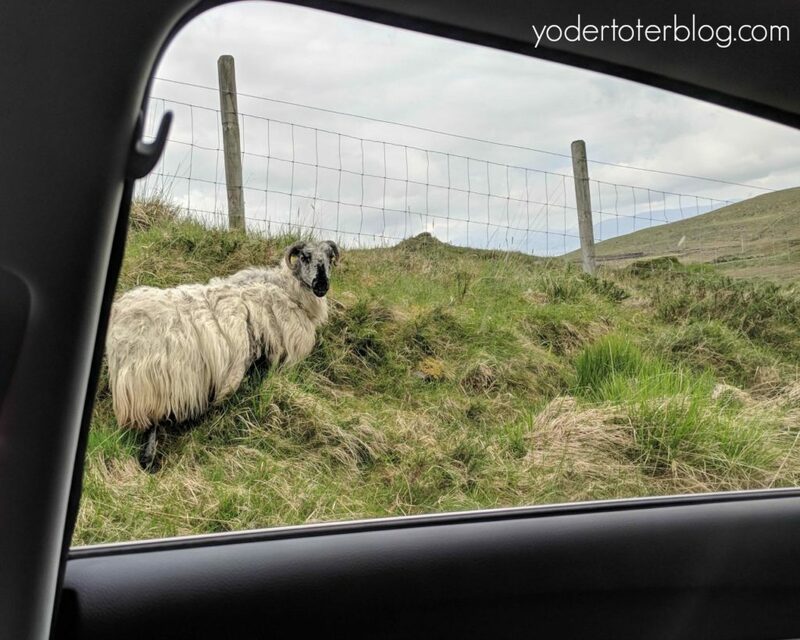 Driving up the mountains near Caragh Lake, we had our first “Sheep on the road” experience. Within minutes we were so grateful we’d decided to take this shortcut through the mountains. In the time that it took us to reach Ballaghisheen, we pulled over numerous times to stick our heads out the window and enjoy the view. Every vista felt like quintessential Ireland. And then after winding up and down and all around, the crooked made straight and we arrived at Ballaghisheen Pass. The Ballaghisheen Pass runs for 5 kilometers, with gorgeous views of the Macgillycuddy’s. We passed a few vehicles, but otherwise, we felt as though we were modern-day explorers on a vacant land! 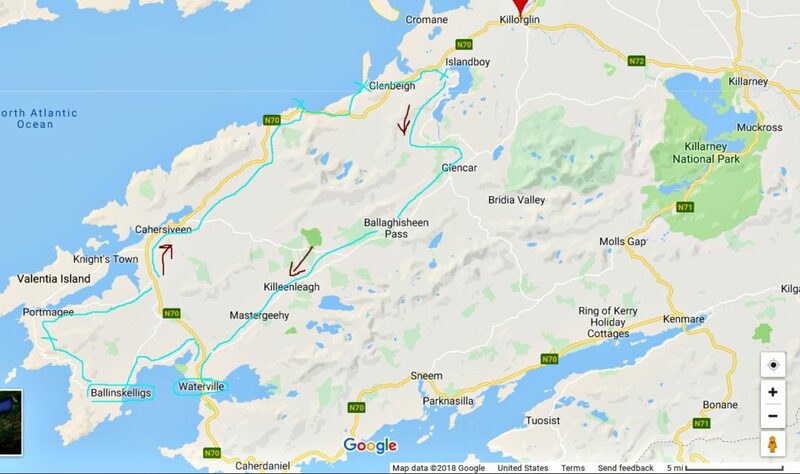 Note: Before leaving Killorglin or Caragh Lake, make sure you have plenty of gasoline and have hit the restrooms. There are very few amenities on these roads – just sheep and views. The next stop on your one-day itinerary of the Ring of Kerry is Waterville. We arrived in Waterville around 11 am just as the tour buses were arriving from the south. The population of Waterville tripled in a matter of minutes! We had no trouble finding a spot to park, but because of the crowds, we decided not to queue for a picture with the famous Charlie Chaplin statue. 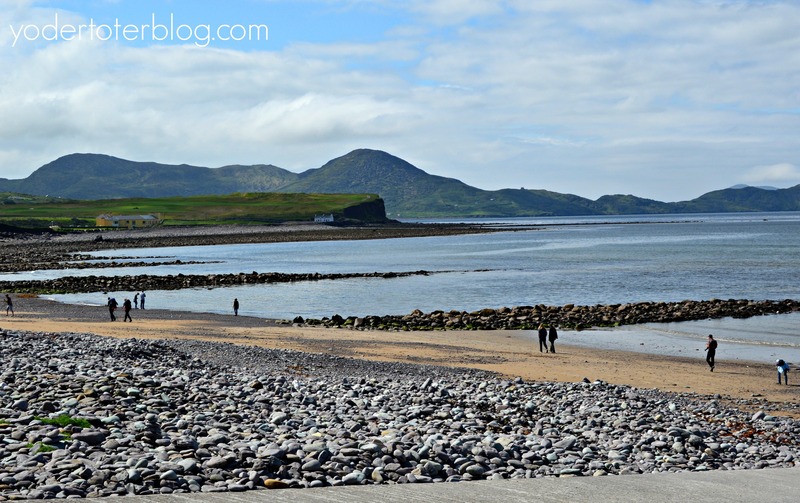 The view from Waterville reminded me of some of the rocky coasts of Australia. Thankfully, a tour bus had parked us in, so we made time for a coffee at the Sea Lodge. Mr. Yoder and I agreed that someday we’d come back to this hotel without the kids and hope for the same glorious weather. Just north of Waterville you’ll exit the N70 and turn left onto R567. This route will deliver you onto the Skellig Ring. By this time it was past noon and the kids were hangry hungry. When we spotted the sign for a beach we all agreed to stop. Ballinskellings Beach rates as one of the prettiest places we have been. A 16th-century castle. A white sand beach. Azure-colored water. Can life get better? The Skellig Ring has blossomed in popularity since the release of Star Wars: The Force Awakens. The movie concludes with a young rebel, Rey, handing Luke Skywalker his lightsaber on top of Skellig Michael, an island off of the coast. You can get a view of Skellig Michael from the Skellig Ring, but the weather needs to be really good. Unfortunately, the closer we got to the island, the heavier the mist and fog settled in. We did see Skellig Michael, but with the fog, it hardly shows in photos. 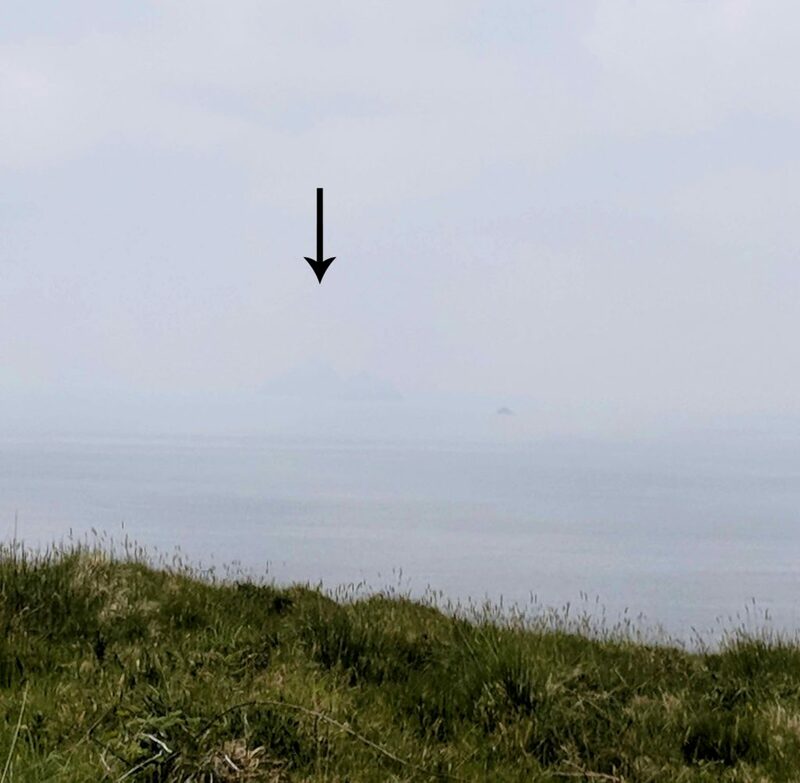 Whether you see Skellig Michael or not, the Ring of Skellig was very quiet. 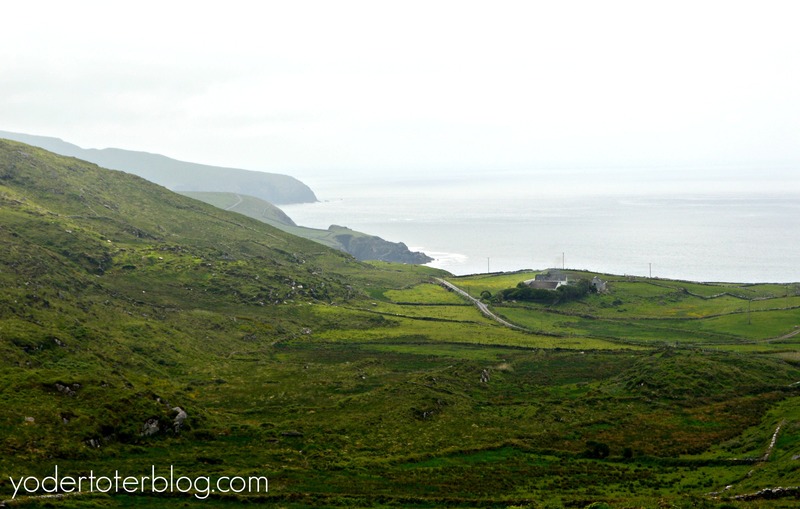 This remote area was similar to the Dingle Peninsula and Slea Head drive. 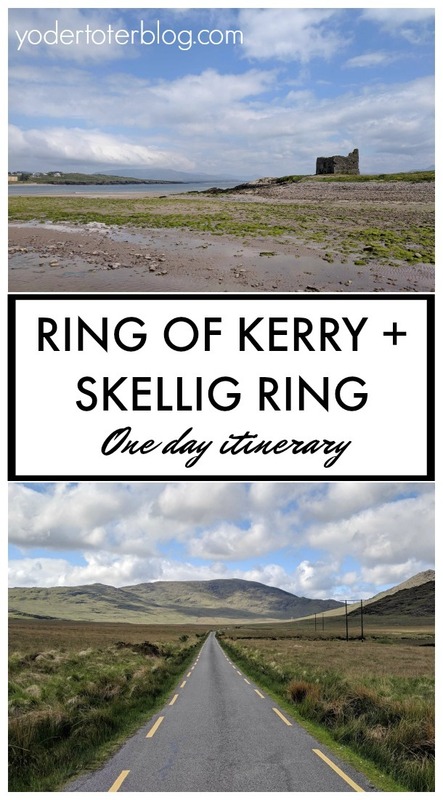 If you don’t have time to travel to the Dingle Peninsula, try to add the Skellig Ring. If you struggle with anxiety, the Ring of Skellig is a step of courage. At one point we met a car on such a narrow strip of road that my husband had to PULL IN HIS MIRRORS. How our rental car was returned with no scratches is a complete mystery! Nearly 2/3 of the way around the Skellig Ring you’ll see a spot to pull over for photographs, simply known as “Cliff View” This area allows you to look down towards Skellig Michael and also over the town of Portmagee. If you travel a few more minutes down the road you can stop for a hike to see the Kerry Cliffs. Our son had a broken foot, and the climb looked like more than we should allow him to do, so we abstained. We made a brief stop in Portmagee only to visit the Public Restrooms. 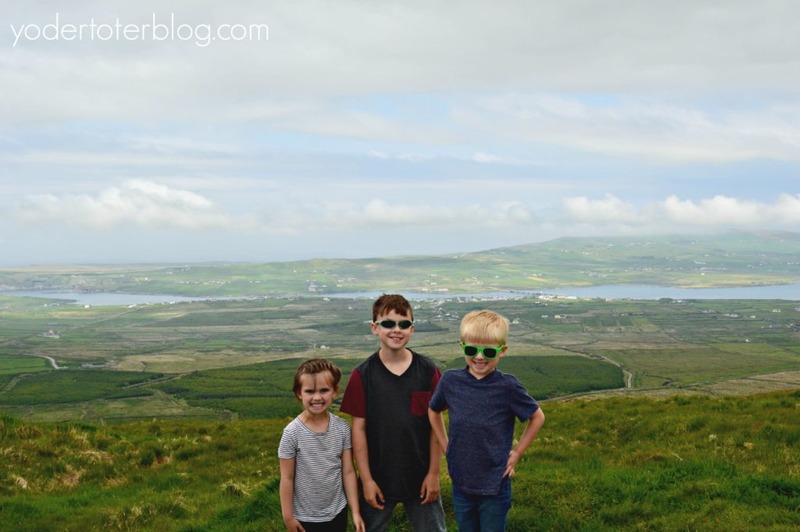 Had we more time, we would have stopped at Valentia Island. 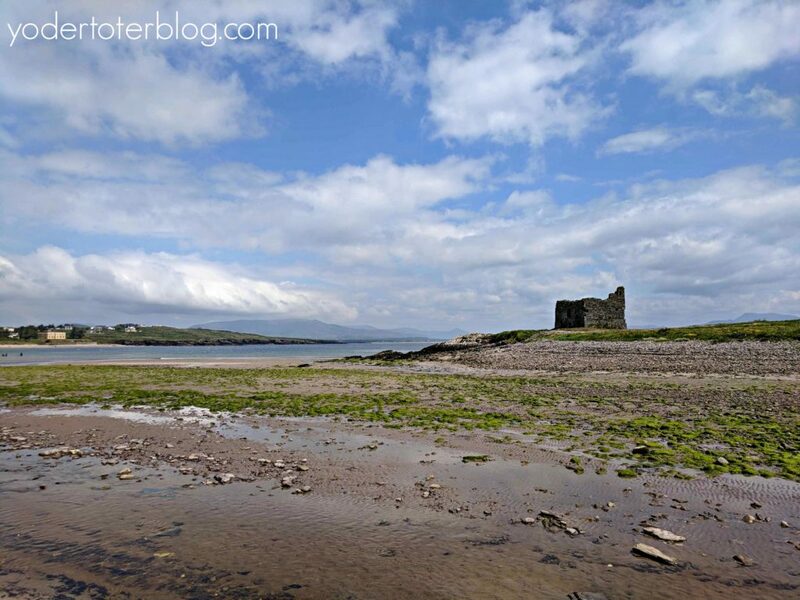 After our stop in Portmagee, we traveled back on the N70, the Ring of Kerry. We stopped for a few photos at the “Dingle Peninsula Viewpoint” but left the kids in the car as we were on the edge of the cliff and the side of the road. Unless you’re prepared to unstrap kids in dangerous locales, there will be places throughout the drive where it’s best to just let them look from safety in the car. The beach to the far left is Inch Beach on the Dingle Peninsula. 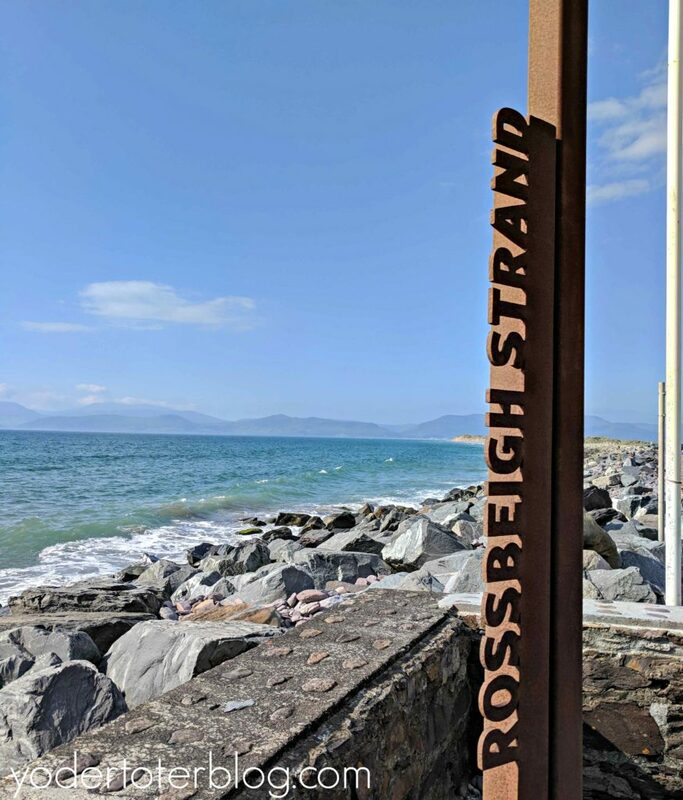 Rossbeigh was our most surprising stop of the day! Mr. Yoder had spent some time researching the night before to find a good playground along our drive with which to “bribe” our kids. #noparentingshame. You give us a good day of travel, we’ll stop at a playground before heading back to the Airbnb. 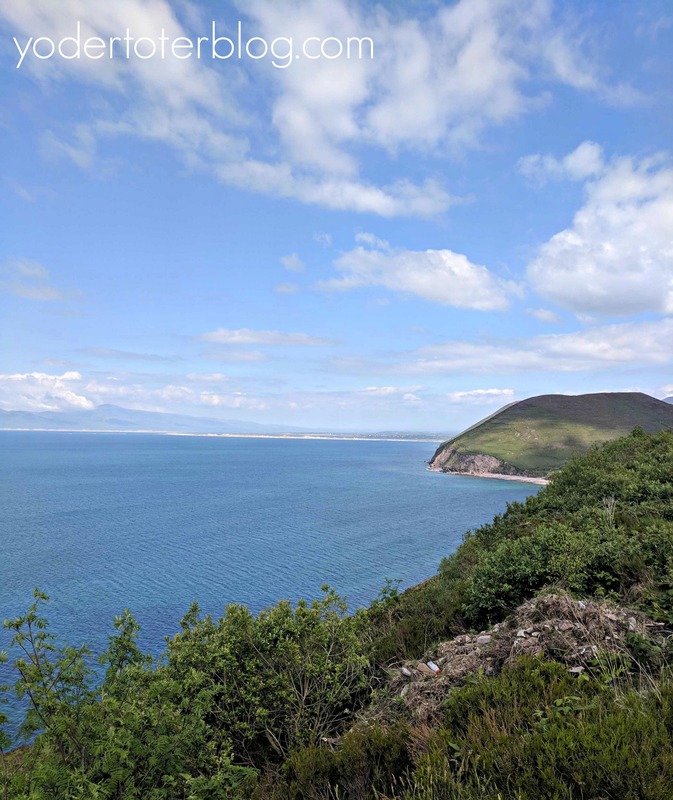 As we left the Ring of Kerry to drive into Rossbeigh, We descended a lush, green hillside to arrive at a quiet beach, with a view to the Dingle Peninsula to our north. After allowing our children an hour of play, we ate an early dinner at the Rosspoint Bar & Restaurant. We found this to be a very friendly pub with delicious offerings. A pool table kept the kids busy. With our stomachs full, and our hearts even fuller from fantastic views and warm people, we headed back to our Airbnb. (Save money when you book your first Airbnb- CLICK HERE). 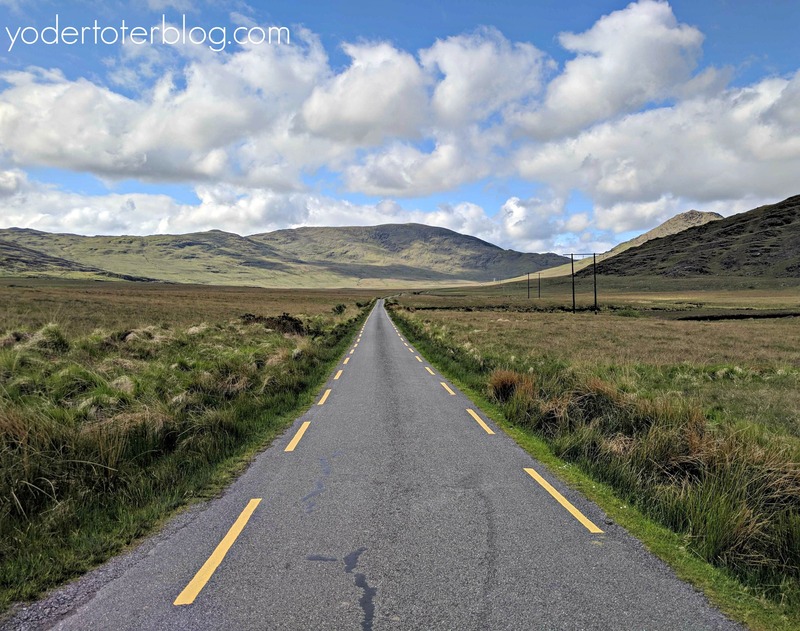 The Ring of Kerry & Skellig Ring drive was one of our best days on the Emerald Isle. 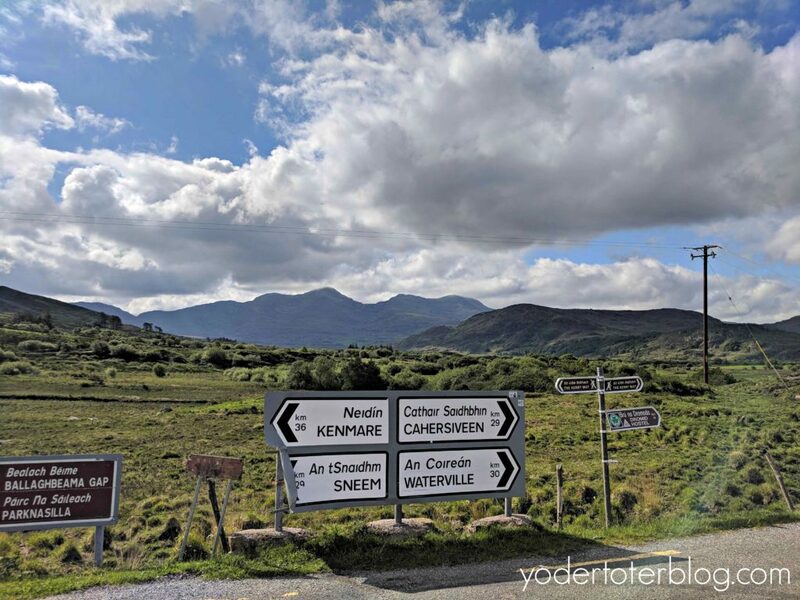 Have you been to the Ring of Kerry? What do you think would be your favorite stop?